Matched to our bestselling and trusted The Complete Companions Student Books, and AQA's A Level examination requirements this Revision Guide has been written and reviewed by examiners, providing you with clear, focussed coverage of everything you need to know so you can approach your exams confident of success. Recap key AO1 knowledge and AO3 discussion/evaluation points with just the right amount of information for each topic to consolidate your knowledge and understanding. Apply what you know with targeted revision activities that rehearse key examination skills and guide you through answering every question type you might face. Review and track revision with suggested consolidation activities to embed your learning. 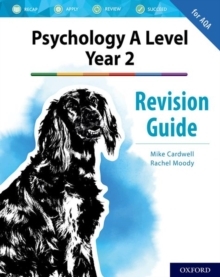 Perfect for use alongside theStudent Book or as a stand-alone resource for independent revision, this colourful Revision Guide helps you Recap, Apply, Review and ultimately Succeed at A Level Psychology. Other titles include:The Complete Companions: A Level Year 1/AS Psychology Revision Guide for AQAThe Complete Companions: A Level Year 1/AS Psychology Student BookThe Complete Companions: A Level Year 2 Psychology Student BookThe Complete Companions: Paper 1 Exam Workbook for AQAThe Complete Companions: Paper 2 Exam Workbook for AQAWorkbooks to support A Level Paper 3 optional topics also available.